LAS VEGAS, Nevada – With more than 1,500 television productions per year including The Voice, The Winner Is, F-1 Silverstone and DWDD, DutchView is the leading broadcaster in the Netherlands. Whether recording these programs in one of its 14 studios or on location, DutchView often relies on HARMAN’s Studer digital consoles for high-quality sound mixing. In 2007, DutchView equipped its DV2 OB van with a Studer Vista 8 for medium-sized productions. In 2010, DutchView added a Studer Vista 5 console at its Westergas Fabriek studio, from which two of the Netherlands’ most popular primetime daily talk shows are broadcast. In 2011, Heynen bv (Studer’s supplier in the Netherlands) and DutchView came to an agreement for the upcoming years regarding the delivery of Studer digital mixing consoles. The choice for Studer was based on good pricing and a strong brand, but most of all it was based on DutchView’s positive experiences with its previous Studer Vista consoles. 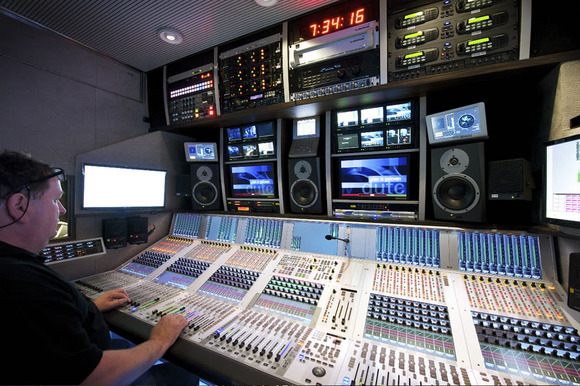 In February, DutchView outfitted its new DV8 OB van with a 62-fader Vista 9 console—one of three Vista consoles it plans to add to its new OB vans in the near future. The brand-new DV8 OB van is designed to serve a wide variety of customers in both low and high-end productions. DutchView is very pleased with the routing and layering capabilities of Studer digital consoles, especially in combination with providing the highest possible sound quality levels for any digital console. DutchView also finds the intuitive “analogue approach” of Vista consoles very attractive. With 62 faders, DutchView is able to have all of its important sources directly on the faders, including EQ, dynamics and panning. In combination with FaderGlow and Vistonics™, this gives most audio engineers the ability to work in an intuitive and familiar manner. This is crucial when preparation time is getting shorter by the day. Another advantage of the Vista 9 is its ability to handle a lot of different feeds, which is needed for huge events like Domino Day, where 30 receivers and 140 microphones were used. In these cases, the Studer compact stage box is also a good asset, especially for controlling the preamps directly from the desk surface. DutchView is very involved in Sustainable Broadcasting. By implementing all kinds of different innovative solutions the DV8 uses up to 40 percent less energy than comparable OB vans. This is possible by using more fibre optics instead of copper, a low emission engine, a balanced cooling system and the use of LED lightning. In turn, DutchView is pleased that both Heynen bv and Studer share the company’s philosophy on Sustainable Broadcasting to help maintain the highest standards of quality and environmental responsibility. At this moment, Studer is already building a second Vista 9 for the DV9 OB van, which will be identical to the DV8. It is expected to hit the road sometime in the second half of 2012. With these new OB vans and the intensive technical support of both Heynen and Studer, DutchView will continue its leading trend-setting role in the Dutch broadcast landscape.